A fourth slice of jazz prog sludge heaviness, LOUD BASS LOUD HORNS LOUD DRUMS LOUD RIFFS. 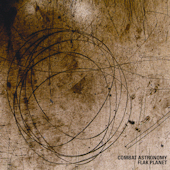 Flak Planet is Combat Astronomy's fourth album as an ensemble. As ever, this outing sees the band stubbornly idiosyncratic, hypnotic and heavy. Combat Astronomy continue to achieve alchemical brilliance in their fusion of 70's influenced avant jazz and 21st century doom metal, producing something (yet again!) rather special and rather unique. The result is a sprawling, martial beast: kicking and screaming in its joyous fractal webs. Huggett's overdriven double-tracked bass churns in complex cycling patterns of additive time signatures, locked with the intricate drums, never failing to conjure an incessant force wall of grinding poly-rhythmic groove. Danceable, yes, though probably for the disco at the end of time. The music asks you to submit to its ecstasy, uncompromising as it may be.